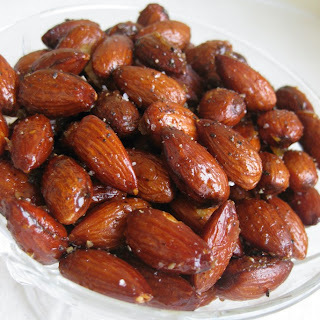 These almonds are a perfect combination of sweet and spicy. The cayenne gives the almonds a wonderful warmth. I used almonds in this mix but you can use whatever nut mix you have on hand. Make plenty though, because they will disappear quickly. Enjoy! 1. Preheat oven to 350 and place a baking rack in the center of the oven. Line a large baking sheet with foil and grease the foil with some vegetable oil. 2. In a saucepan over low heat, combine honey, oils, sugar, cayenne, chili and salt. Heat until well the sugar is melted. Stir often. 3. Add the almonds to the honey mixture and stir until the almonds are evenly coated. 4. Spread the almonds onto the baking sheet and make sure they are in a single layer. 5. 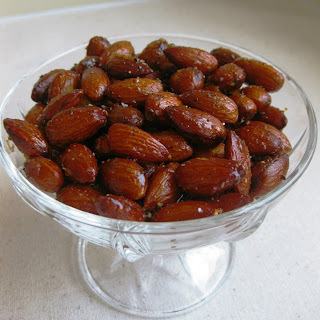 Roast the almonds in the oven for 13-15 minutes; stirring frequently until they are nicely glazed. Watch the nuts carefully as they bake because they will burn quickly. 6. Remove the hot baking sheet from the oven and transfer the almonds to another baking sheet to cool. Sprinkle with freshly cracked black pepper. Cool completely. 7. Before serving the almonds, break apart any almonds that are stuck together. These look so good! I love candied walnuts, but I've never tried it with almonds before. I made this to copy the new york city street food and i absolutely loved it. the recipe i used was very similar - love the color on yours! OMG do these ever sound so delicious?? I love all the flavors!! Pretty picture, I want a handful! I love this! Especially since there's not a ton of sugar--so many nut recipes call for too much! These sure look great. I wonder what your inspiration is for some of your great ideas. These look SOOO good. Almonds are one of my favorite nuts! We always have almonds around since they're such a healthy snack. I will definitely be trying this recipe - they look amazing! I love the sweet and spicy combo. These would be a nice addition to a wine-tasting party. They'd be perfect for a Reisling or even a full-bodied red. Thanks for the recipe! These look great and almonds are good for you too. Great post. I've missed you while you were on vacation and glad you are back. Happy Easter to you and your family. I bet these babies are addictive! They look awesome! Mmm, those do look good! And easy too. These look really yummy! I love nuts so much that I tend to not have them around much because I cannot stop eating them when I start! I see you aren't too awful far from me. I'm on the other side of the border - Across from Brockville. What a tasty looking snack! These look like they would be just perfect for munching on! Hmmmm, Imight have to try this as I just bought a pound of almonds. Me love some almonds! I'm going to follow your blog now! Wow... this is yummy. I will make this for snacking while watching the idiot box :) Thanks for sharing. I love your blog ! Nicely done. Been trying to incorporate more nuts into my diet and eating them plain well tastes plain. Those almonds look so good. I'm so making these. I love warm nuts...be it one type or a combo. Also, try using egg white to help the seasonings stick. I made a recipe similar to this around the holidays - Christmas parties and all that - but mine had sesame seeds involved too, which I can officially recommend if you're looking for tasty variations on the theme.